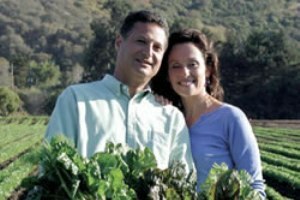 Drew and Myra Goodman, founders of Earthbound Farm in Carmel Valley, California. Myra and Drew Goodman, founders of Earthbound Farm in Carmel Valley, California, established the Earthbound Farm Environmental Stewardship Award within the Department of Environmental Studies at UC Santa Cruz. Drew Goodman, a 1983 UCSC alumnus who received his degree in Environmental Studies and Environmental Design, and Myra, are dedicated to organic agriculture. Earthbound Farm is the largest grower of organic produce in the world and enjoys a national reputation. The Goodman’s commitment to protecting the environment and desire to support the mission of Drew’s alma mater motivated them to establish this award in 2006. In order to assist UC Santa Cruz in promoting its educational mission and support UCSC’s programs of research, instruction, and outreach in protecting and conserving the environment, Earthbound Farm gives $4000 annually for two awards, one new award and one renewal award. These awards are based on academic merit and active engagement in and commitment to protecting the environment through organic and sustainable agriculture. As long as the new recipient remains in good academic standing, enrolls at UCSC for the following year, and continues to study organic agriculture he/she is eligible for the renewal award. For more information please call (831) 459-2634 or email the Environmental Studies Department, or visit the department’s website.